Description: Gray-green cinquefoil leaves, yellow flowers shaped of stars, the scent of apricots and seeds or burrs that stick to your garments as you pass by. Medicinal Use: Steep fresh leaves in water to make infusion, used as an external astringent to stop bleeding and for treating wounds. Use the more delicate parts of plants. 3 cups of water to 1 ounce dry herb or 1½ ounce of fresh herbs; pour the freshly boiled water over herbs in a pot, cover the pot and let the herbs steep for at least 10 minutes. Strain. This herb is also used to treat jaundice, as it is tonifying for the liver and assists in making this organ of the body more efficient. (Remember the doctrine of signatures). Agrimony is an astringent and is used to staunch the flow of blood within wounds. It is also been used since antiquity for the healing of the eyes. Not commonly known, Agrimony is used to stop loss of the hair in both men and women. A tincture extracted in 80-100 proof vodka, macerated over 2 weeks to 1 month or one moon cycle is very effective in this way. 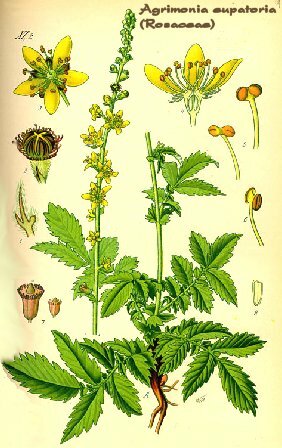 Magical Uses: Agrimony is used interchangeably with Cinquefoil which is also known as Five Finger Grass. This herb is protective and should very easily find its place in absolutely any and every protection spell and formula. Agrimony protects against all negative magic and energies, and indeed will not only thwart such workings but will reflect them right back to the sender. Agrimony can be used to quell the nerves of those who feel that they are under such magical and psychic attacks. If placed under the head, it can cause a very deep sleep. This should be used with caution, as it has been warned by many that such sleep cannot be broken until the herb is removed from under the pillow of the sleeper.Agrimony is also used as protection against goblins and poison. And this Wytch’s own considerable notes and experiences about this herb. Parts Used: Flowers, young leaves, Secondary leaves, root, (stalks for divining sticks – China) Best gathered in August when in full bloom. Yarrow has been used since antiquity for the healing of wounds. Wounds that are deep, even cuts to the bone are benefitted by Yarrow. Yarrow offers also mild relief from pain including headaches. It works to the third level of cuts and wounds, and addresses the fevers associated with cuts and deeper wounds. Yarrow it is said is dedicated to the “Evil One”, hence some of the names such as Devil’s Nettle, Devil’s Plaything, Bad Man’s Plaything. Yarrow was used for divination in spells and the stalks used in Divination sticks for the I Ching in China. In the Highlands of Scotland there is an ointment that is made from fresh herb. This is good for piles, and is also used against the scab in sheep. Fresh leaves are used to help stop toothache. 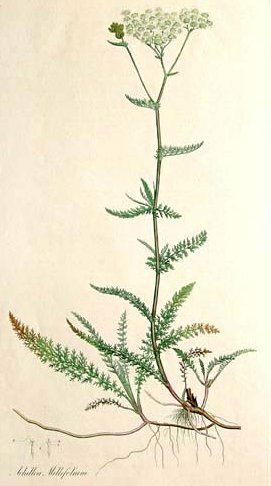 Yarrow has been used as the basis for a beer and is found to be more intoxicating than that which is made with hops. Magickal Uses: Yarrow can be used in a magical bag or sachet as well as incense to bring courage. It is excellent in bringing back long lost family and friends. Infusions of Yarrow can be sued to banish all sorts of malevolent spirits from both person and home. It is used as a scent in essential oils to enhance friendships and mutual respect between people. Yarrow encourages intuition in all of its forms and helps instill common sense and good negotiations on all sides.